Though Maura's very early work was definitely fantastic – heavily influenced by Max Ernst, Dali, and her own mystical dreams – she did not anticipate the full flowering of her visionary kinship until seeing the art of Ernst Fuchs. This profound event occurred when she was twenty-four, at a party, where someone handed her a book of Fuchs' art. From the moment she held the book, Maura has been a devoted fan, strongly influenced by Fuchs and his lineage. 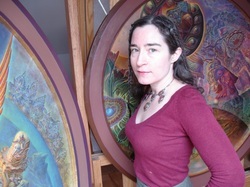 Maura has never had formal painting instruction, but has pieced together her own education from a combination of book research, experiments with art materials and techniques, looking at other artists' work, and a lot of time at the easel. on Life", at the American Visionary Art Museum, followed the next year by another, "Golden Blessings" at the same museum. Her contribution of five paintings to the first of these shows brought many new friends and connections, and Tom Patterson, the curator of "High on Life", later went on to write a feature article about Maura and her work for Raw Vision Magazine, issue 56, Autumn 2006. Maura's involvement with AVAM and Raw Vision linked her to the Outsider Art movement, which encompasses Art Brut and all self-taught artists. In 2003 Maura participated in the Society for Art of the Imagination's "Brave Destiny" show, at the Williamsburg Art and Historical Society, again re-enforcing her emphasis on the fantastic. After this show, it would be three years before Maura unfolded further into the public sphere. In 2003, she embarked on an experiment in consciousness, repairing to a hermit's cabin in rural Vermont, beginning a new shamanic nature-oriented phase, and a new body of work…. Around 2007 Maura became pen pals with Laurence Caruana, at first corresponding with him mainly about philosophical, spiritual and aesthetic ideas. Their friendship became more personal over time, eventually leading Maura to participate directly in the Visionary Art community. In 2011 she joined Laurence, Amanda Sage and Andrew Gonzales in teaching the "Visions in the Mischtechnik" seminar, in Tori Superiore, Italy, where she lead a drawing intensive. She will return to Tori Superiore to teach painting at the seminar in 2012.